Microsoft Hyperlapse, like Instagram Hyperlapse. Last year we reported on Microsoft's research into video stabilisation technology, and today the fruits of those labours have arrived in the form of apps for Windows Phone, Android and the desktop. Essentially, it adds a timelapse effect while steadying the footage at the same time. The software lets you turn your long, tedious, shaky clips into "easily consumable, enjoyable experiences" which could do wonders for your YouTube channel's viewing figures. You can head to the apps download page to get started with Microsoft Hyperlapse, and free apps are available for Windows Phone 8.1 and select Android phones - specifically the Samsung Galaxy S5, S6, S6 Edge and Note 4, the Google Nexus 5, 6 and 9 tablet, the HTC One M8 and M9, and the Sony Xperia Z3. 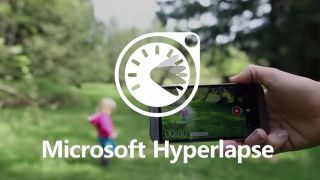 The Microsoft Hyperlapse Pro Preview is available for Windows 7, Windows 8 and Windows 8.1 and is aimed more at professional video makers who want to get serious with their filmmaking. A version is also available for Microsoft's Azure cloud platform. Quite why Microsoft is using the same name for its video stabilisation technology as Instagram does isn't clear. Instagram's Hyperlapse is iOS-only for now so perhaps that's why Microsoft is avoiding iOS with its own software. At first glance this looks like a more powerful beast: you can go way beyond the 6x speed limit in Instagram's Hyperlapse and access 3D modelling stabilisation in the Pro desktop software. If you want to turn your phone into a GoPro, it's worth checking out. What's Microsoft got in store for Windows 10 Mobile?